Short strangle is exact opposite of long strangle. I will discuss it soon but before that I would like to tell something. 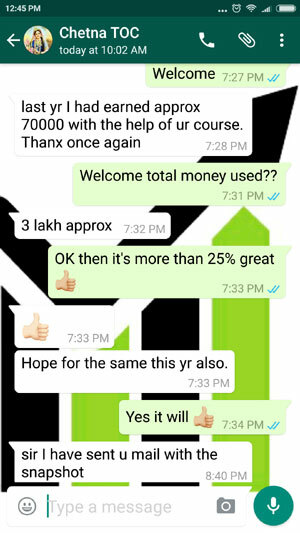 Since I started the options trading course many traders have called me. Most of the traders actually trade this particular trade and you know what, they lose money. I feel bad when I see that most traders lose money. I can only see that the main reason is greed. You will soon learn that short strangle is such a trade that it will tempt you to be greedy. This is a trap and most traders fall for it. The results? They lose money. How to Trade the Short Strangle? In Short Strangle a trader will SELL an OTM (out of the money) call option and simultaneously SELL an OTM put option. Remember in long strangle a trader buys an OTM call option and an OTM put option. IMP: The total lots sold for the call option should be equal to the total lots sold for the put option if you want a neutral Short Strangle. Risk: Unlimited. Let me warn you – losses can be severe. In other words – we do not sell the call option to make money, also we do not sell the put option to make money. 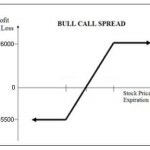 We sell call option as a hedge against the put option and we sell the put option as a hedge against the call option. Therefore lots of both the options should be same. Now you should understand this – if the call option loses money, the put option makes money. And when does that happen? When the underlying goes up. Similarly if the put option loses money, the call option will make money. When does this happen? When the underlying goes down. What happens if the underlying does not move? This is an excellent situation. Time will eat the premiums of both the call and the put option. If the underlying does not move much and remains range bound – both the options will expire worthless and the trader can keep the premium. As you can see, at least one position always make money or both positions makes money. Good news right? Well this good news is actually a trap and many Indian traders fall for this trap. They just sell both out of the money call and the put options. Next day when they see money in their account – they feel very good as if they have actually won the trade. Little do they realize that they are sitting on a hot tub and the day it gets overheated – they will burn their fingers. Do not underestimate this trade. I used to trade this trade myself. Trades who trade Short Strangle know that getting returns of 15% or more per month is possible in this trade. Its a nasty trade, when all goes fine – its a superb trade, but when it does not work – it takes away all your profits made for the last few months and then some principal amount too. When trades win, they think they are masters. And when they lose – they just blame it on luck. 3 months of laughter, and 1 month of destruction. Overall in 4 months time the trader looses money. Then he thinks OK, this was the last time I lost money and it will not happen again. Unfortunately, the cycle repeats again and again. They remain where they were years back. If you are trading Short Strangle you should always buy some protection on the call side as well as on the put side. In my course on trading options you will learn some hedging techniques that will help you to limit your losses. So lets do a Short Strangle. The total points received: 38+37.40 = 75.40. Which means if Nifty expires within this range: 7424.60 to 8075.40, then the trader will make money, or will at least not lose money. It looks like a very easy trade. What is the probability that Nifty will go above 8075 and go below 7424 within the next 30 days? Yes today the chances of moving this much looks small, and the trade looks good. But I can guarantee you the situation will not be same after 10 days. This is the trap. Traders think Nifty will not move beyond this as today it looks impossible. But when Nifty will move 100 points in a single day – the probability of moving beyond these limits will start to get bigger. If it actually goes there the trader will panic and take a stop loss. The fact is. It is not an easy trade. When Nifty starts to move in one direction, that side of the option starts swelling in value. The other side starts to shrink – but the problem is it can only shrink to 0. The trader has a limited profit there. After that the losses are unlimited. How to adjust the Short Strangle trade? 1. One of the best ways is to take a stop loss. Once you take a stop loss – your losses cannot accumulate. Then enter the markets again when the picture becomes clear. 2. Another way is to buy options. But by the time you will want to buy an option for protection – you will see that the options have become very costly. But if you want to hedge, you have to buy it. I can teach you some great hedging techniques in my Nifty Option Course. Using these hedging strategies you can make monthly income peacefully up to 5% a month. Contact me if you want to learn. One day a trader from Bangalore called me and told that he does Short Strangles. I asked him what does he do when Nifty starts to move beyond his break even points? He told me then he buy/sell futures. This is a bad adjustment. Why? What if the markets reverses from that situation? 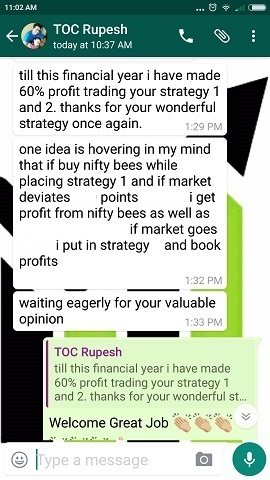 Future moves one point with every one point in Nifty. If next day Nifty opens against the future gap 200 points – 3-4 months of profits gone. 3. Another good adjustment strategy is to rollover the position. Yes it is good, but the problem still remains. Most of the time when you adjust, you will lose money in Short Strangle. So you should try to rollover soon. In that case you will keep rolling over. If you do not know what rollover means then it is closing the current position and at the same time or soon opening another Short Strangle of the next month expiry. Traders can also change the strike prices. So you should know to create a level where you will either take a stop loss or rollover the position. When you rollover you should make sure you have made the trade somewhat natural. Which means the premium collected from the call side is equal to the premium collected from the put side. This will make sure that profits equal the losses up to certain extend. Also you should try to book profits and exit the strategy as soon as possible as this is an unlimited risk strategy. For example if volatility drops you can make good profit in a few days. You should then exit the trade. 4. And the best adjustment advice: Do not get greedy and trade too many lots when trading Short Strangle. Yes receiving money the next day looks good, but your job is to protect that cash. You will be very worried if Nifty starts to move against your trade. If you want to trade Short Strangle on Nifty I would advise never increase the lot size to more than two, I mean two lots on the call side and two lots on the put side. 5. Never trade them on stocks. Stocks can rise or fall 10% in 1 day. You may wipe out your account in matter of days. Have you ever traded short strangle? What was your experience? Short Strangle is not a good strategy. 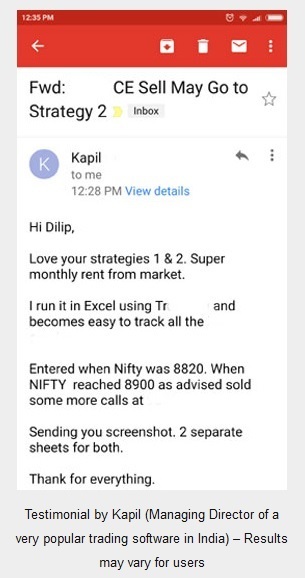 Once even I used to make 15% returns a month. But when things go wrong, usually every fourth month, it not only took the profits away but it also took away a huge chunk of the principal amount. 🙁 Then I stopped trading Short Strangle. The problem with managing Short Strangle is that one portion gives huge loss if the stock keeps moving in one direction. Imagine not having a Car insurance and meeting with an accident. At that time you will end up paying “whatever” a car insurance company is asking for to insure your car. Sometimes it gets even costlier than the cost of repairing the car without insurance. (In real world no company will give insurance after the accident – this is just an example to help you understand the problem). You can buy some OTM options when initiating the trade itself. If you don’t like doing it, you can buy some ITM options when one of the shorts is nearing ATM – but again they will be costly. Exit both positions at one time. 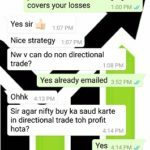 You can do my Nifty Option Course for better hedging strategies. – That’s the reason you have to be disciplined and stay small relative to your account size. Unless you are commanding a substantial amount of capital, trades should be limited to 2 contracts max. – Strangles are excellent vehicles in trading ETFs. Stocks get more affected by large moves during earnings, news, or just flat out panic. – Also is you restrict your trades to only times when the underlying is experiencing high implied volatility, you have a much greater edge. The eventual contraction in vega will roll in profits quickly. – Lastly, it is not necessary to hold to expiration. Set a profit target and get out of the trade. Profits accumulate on collecting smaller profits over and over instead of looking for a big home run. Do these and your short strangle losses will dramatically decrease! Really valuable comments. Please keep commenting. These kinds of comments help traders. iv been trading options for the past 6 months. Mostly shorting options to earn premium by time decay. 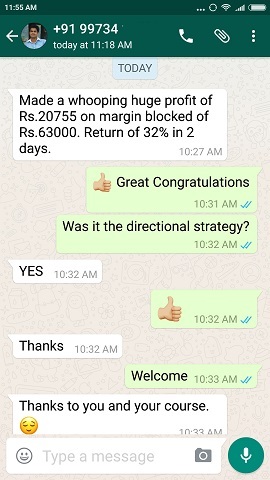 4) I track the positions on daily basis for just one important criteria: if the premium of any one option position becomes half (eg if ashok leyland call was sold at 0.8 and put was sold at 0.8 ,and if ashok leyland corrects and the call sold at 0.8 becomes 0.4 , then I cover both positions . Usually this strategy works for me. You must have started selling options when you lost heavily buying options. This is the story with everyone. Whatever you are doing, it is ultimately naked selling of options means you are not buying protection. looks great when you are safe and winning – but one big loss will take away months of profits. You will forget everything and start selling again. This happens years after years. After 30 years your account will still be in small profit or small loss or huge loss – BUT NEVER in HUGE profits. On top of that overnight risk is there – you will not be able to sleep properly. Is this the way to earn money? There are hundreds of ideas to sell options and book profits – but non works when trouble comes. On top of that you cannot compound your profits to make huge profits selling naked options. Note: I deleted your mobile number because this is open to public website – anyone could have seen your number. And ur right…iv burnt my fingers buying options…. How to play a short straddle. nothing much wrong in selling strangles. the trick is to pick your strikes wisely. a good technical study should do. Remember, selling options is not about risk to reward ration, rather it is about probability of wining. data suggests you gain every 8 days out of 10. avoid being aggressive in a down trend. And yes, you must and i repeat you must keep on switching your strangles with the trend. there is a certain amount of maximum profit which a net credit short option strategies will show in day. try to book your profits there and let the markets move a bit before deciding new strikes. Or you learn about delta hedging of your positions. learn to relate VIX with the trends. When market makes it to one-side, how about closing the profit side and opening another Short Strangle as per current market spot? You can try that but constant monitoring required.